The overall aim of this programme is to help parents or guardians in their role in parenting their children to have healthy friendships and relationships at home and in their personal lives. The programme informs parents or guardians on what is taught in relationships and sexuality education (RSE) and the approach that is used by the teacher. It enables parents to have a clear understanding of the content of the RSE part of the Social Personal Health Education (SPHE) curriculum. This session explores what RSE means to you as a parent. It looks at the aims of the RSE Programme and outlines the SPHE curriculum and how your child is taught in school. The information module also explains each session of the NPC Parenting – Supporting your child to build healthy friendships and relationships and explores listening and self esteem. The session runs for two and half hours and is open to all parents and guardians of Primary school children. Delivered over three two and half hour sessions, this module helps parents have a better knowledge of Relationships and Sexuality education so that they can talk to their children and foster their children’s self esteem and decision making skills in this important area of their lives. The sessions mirror the curriculum taught in schools. This module is on offer to groups of no more than 15 parents per session. The programme is most beneficial if parents attend all of the workshops. The module is available to all parents and is delivered in individual schools. This programme is funded by the HSE Crisis Pregnancy Programme. Speakeasy is a skills based eight-week course designed to provide parents with the information, skills and confidence needed to talk to their children about relationships and sexuality. Speakeasy Plus is an eight week guided course for parents of children who have an Intellectual Disability and/ or Autism specific challenges. 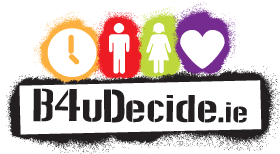 Runs sessions on the transition from childhood through puberty for parents of 6th class students in primary schools, bookings can be made by phoning The Sexual Health Centre on 0214275837.